A man channeling Wild Bill Hickok charged into the bank as if he was chasing a party of renegade Apaches. He marched past the receptionist, by two other loan officers and sat down in the chair in front of my desk without being asked. He had long gray hair tied back in a ponytail, a mustache and a little goatee that came to a point below his chin. “Wanna’ get a loan,” he said and slid a brochure across the desk in my direction. He wore a suede jacket with fringed leather dangling from the sleeves and granny glasses like John Lennon used to wear. I picked up the brochure and opened it to the first page. It was one of those cattle deals that were the darlings of the investment world in the eighties. They were disguised as investments in cattle ranching, but in reality were created for the tax credits that sprang from a loophole in the IRS code. CPAs and tax attorneys were cranking these things out by the truckload and taking a tasty piece of the action as the General Partners. I’d read dozens of them. Some made financial sense; most did not. “How much you want to invest?” I asked. “Fifty thousand,” he said and spun a business card through the air as if he were dealing poker at Caesar’s Palace. It landed on the business plan. I looked up at him waiting for him to address the disparity. My desk phone rang. I let my secretary pick it up. “Seems like you’re going to come out on the short end of this deal,” I said. “How do you figure?” He said. I glanced across the lobby of the bank. It was a Friday afternoon and the line of customers waiting to see a teller was backed up all the way to the front door. Wild Bill sprang forward in his chair like a horizontal jack-in-the-box. “It’s not my fifty-thousand Mister Bank Vice President, it’s yours.” He sat back in the chair with a devilish grin and patted his goatee with the index finger of his right hand. “Go on,” I said. The deposit balances had my interest. I ran a quick interest rate calculation in my head and nodded. He couldn’t contain his smile and now tapped his goatee rapidly with his index finger as if it were coming unglued and he was making sure it stuck to his chin. “But at the end of the twelve months the fifty-thousand would come due,” I said. The actual business side of these cattle tax shelters were notoriously shabby. Few of them returned anything to the investor but the tax credit, which was usually much larger than what Wild Bill was getting. The tapping of the goatee stopped. “You don’t trust me?” He said. The goatee again. Tap, tap, tap. “Seventy-six percent,” he said. He stood and took the brochure off of my desk. “Much obliged,” he said, and walked out of the bank with a little less bounce in his step than when he’d come in, but twenty thousand to the upside not matter how you sliced it. I confess to a little literary license in the dialogue, but not the perspective of the customer. As a banker in the San Francisco Bay Area and later in Beverly Hills, I reviewed countless loan requests, some for investment purposes but most of them were from customers who had an idea for a new product or service and wanted to borrow start up capital. It is a testament to the imagination of the human mind that people can dream up the some of the most creative solutions to market opportunities imaginable. Some dazzling in their brilliance, others… eh, not so much. But a common mis-step in such requests was a lack initial market research. How big is the market? Who are the competitors? Is there a 900 pound gorilla in the field? If so, who is it? Why are they the leader? How does the competition market itself? What “buttons” do they push in their advertising? Do they have a position in the market and if so, do they utilize it in their marketing? Is there a niche in this market you can grab? What is it? And key…what makes your product different – really different, unique. competition, without mentioning anything that distinguishes them. They may be trying to take a position that is already taken, which results in wasted advertising dollars. A client came to us a few years back with an idea for a technology product that would revolutionize an entire industry. The client was, you know…this is a, “Move over Steve Jobs,” moment in Internet history. He wanted surveys done for buttons and positioning. I suggested that we do some market research to see if there were any competitors and if so, what kind of market share they already had. For some reason, I decided to do some research on my own. It took a while but I not only found a competing product that had just hit the market, but found that their product was better and faster than our client’s. It was a little painful at first, but really wasn’t a sad tale. The client was resourceful and bounced back with a new twist to the product. My point here is a simple one: one should fully understand the market into which they are advertising. If you are promoting the same benefits for your product as the guy down the street, why should someone buy from you? The answer to that comes from surveys, but before that you have to understand your market and your competitors if you want to get the best results from your advertising. Understand the competition and you have the first leg up on positioning your product to dominate theirs. There is another benefit: Properly done market and competitor research will help you raise investor capital if that is something you are intending to do. We recently completed market research studies for two companies: one a technology start-up and the other was in the area of children’s furniture. In both cases, the results of this research helped our clients attract investors. 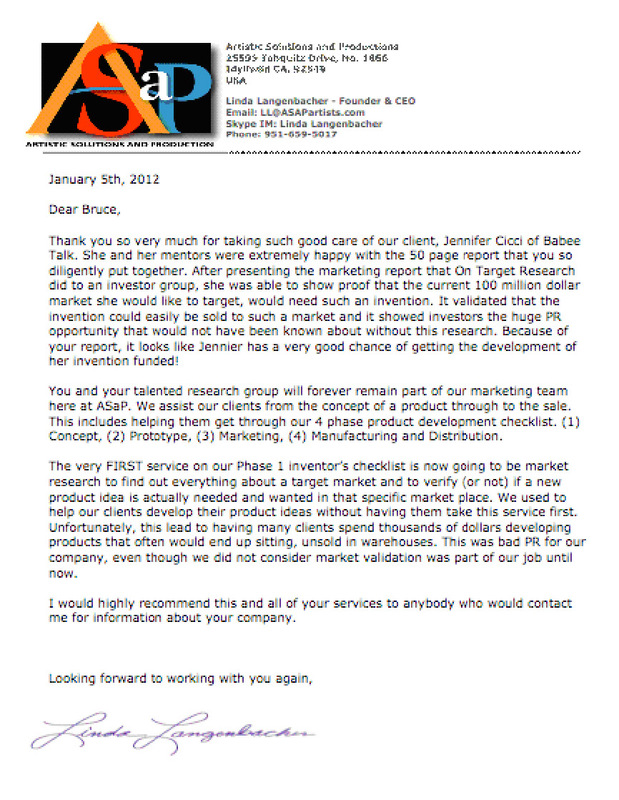 Below is a copy of a letter we recently received from a client. Our client was a company managing the process of bringing a new invention to market. We were retained to conduct the market research for them for their client. The research was extensive, but two key findings emerged: the market was much bigger than had been understood; and the launch of the inventor’s product would be able to ride the crest of a growing public relations movement within the industry. Properly exploited, the movement would benefit the product immensely. The truth is, the client hadn’t asked us for the PR research, we stumbled on it when investigating the overall market. Nevertheless, these findings opened the door to an extremely powerful presentation to investors. At On Target Research we conduct world-class market research, we execute surveys that drive sales, and we create brand positions that sail into the minds of the public and rule the category.